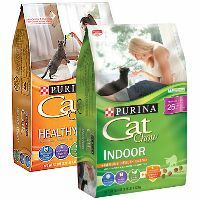 With improved taste, Purina Cat Chow Indoor provides 100% complete & balanced nutrition for adult cats. Its a dry cat food for everyday feeding, formulated to suit an indoor adult cats life. Every meal gives them the 25 essential vitamins and minerals they need, as well as the right number of calories and a special fiber blend to help control hairballs.